128p. bibliog. further reading. index. notes. photos. websites. Lerner. Apr. 2019. Tr $37.32. ISBN 9781541528116. Gr 7 Up—There are many reasons why refugees leave their countries and McPherson's offering presents them in clear and concise language. 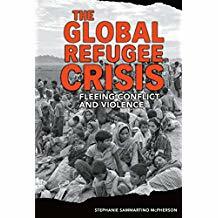 Although commonly associated with war, many refugees seeking asylum flee due to a variety of circumstances (climate, political, overcrowding, etc.) that are often overlooked. This work provides readers with an intercontinental, objective look at the environmental and human forces responsible for the current crisis. Informative, explanatory writing (synonyms and definitions are included for improved comprehension), interspersed with portraits of refugee rights activists, humanitarians, controversial contemporary issues, and first-hand accounts from refugees across the world provide readers with a thorough understanding of the issue presented. In addition, readers are guided through the migrant/refugee experience from the decision to leave, resettlement (and life) in refugee camps, and legal process for asylum seekers in the United States. VERDICT Recommended for school and public libraries serving tweens and teens.